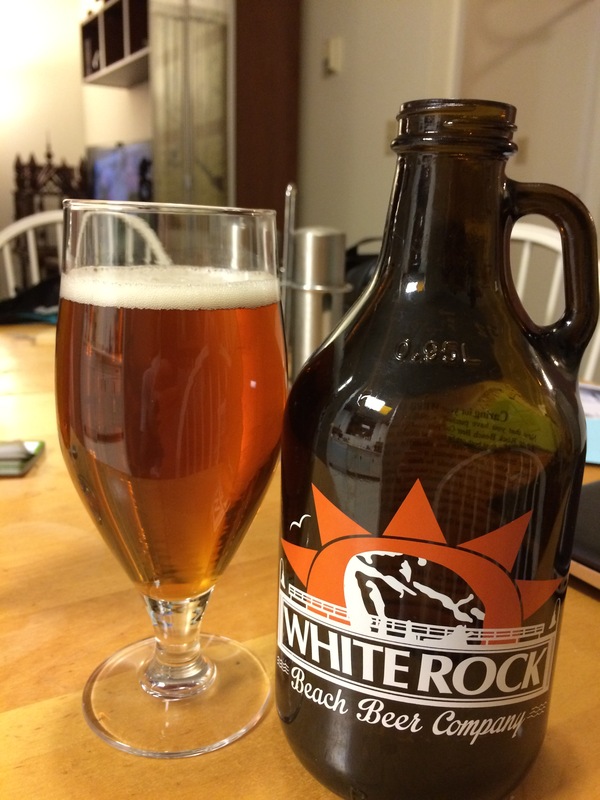 The White Rock Beach Beer Company of White Rock, BC has an interesting take on the American Pale Ale style. A clear dark orange colour with a coarse, parchment coloured head. Little carbonation is visible, adding to the impression of clarity. The name is apt, the nose is full or fruit, most of it sweet mixed with grapefruit. There is a little bit of celery under the fruit balancing the sweet. The first sip has sweet, sour and bitter. There is a surprising hint of strawberry against bitter herbs. The bitter continues further than the strawberries and settles into a more traditional pale ale flavour profile. The hops are noticeable but not overwhelming. The malt does not add particular flavour but a balancing sweetness. The mouthfeel is a touch rough and roudy, rolling across the tongue. This entry was posted in Pale Ale and tagged bc, bitter, bitterness, canada, craft beer, herb, herbs, hops, hopy, malts, malty, pale ale, sour, strawberry, sweet, sweetness, West Beach Fruit Pale Ale, white rock, white rock beach beer company. “Rough and roudy”, love the description. Sounds like a complex profile for an APA.